NJ Paleo Girl: Paleo Friendly St Patrick's Day! No one dish defines St. Patrick's Day quite like corned beef and cabbage--- in America that is… While many North Americans associate corned beef and cabbage with Ireland, this popular St Patrick's Day meal is not a traditional Irish food. BUT, it is Paleo friendly dish, a little high in salt, but a nice festive indulgence! So I have an easy to follow Crockpot Recipe for Corned Beef and Cabbage for you! While the Irish certainly cooked corned beef, it was actually salted pork and cabbage that was a yearly tradition. The majority of Irish beef was exported, making beef an expensive source of protein and out of reach for a majority of Irish citizens. Cows, if owned at all, were only slaughtered when they were no longer good for milking. Pigs were raised for their meat by the Irish. Salt pork and bacon, therefore, became the commonly consumed meat protein on Irish tables. Sir Charles Cameron states that he does "not know of any country in the world where so much bacon and cabbage is eaten." Even today corned beef and cabbage appears infrequently in Irish restaurants, except for those in touristy areas, you’re much more likely to find its traditional counterpart - Irish stew with cabbage and bacon. 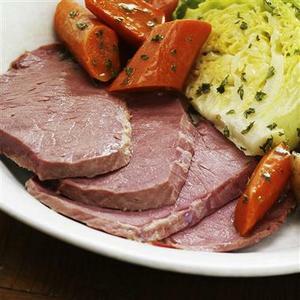 While both salted beef and green cabbage have historic connections with Ireland, the ritual of serving corned beef and cabbage for St Patrick's Day is exclusively an Irish American tradition. The scarcity and high price of beef in Ireland prevented it from being consumed by the majority of the Irish peasantry until arriving in America, where corned brisket and cabbage were cheap and readily available to the poor. As the stigma of eating working class food faded and the celebration of Irish ancestry grew in popularity, corned beef and cabbage became a staple dinner meal for many North Americans every March. So dig in! This recipe for classic Corned Beef and Cabbage is delicious and super easy too!!! Rinse corned beef under cold running water and pat dry with paper towels. Place in Crockpot and sprinkle with contents of seasoning mix. Cover Crockpot and cook on low setting for 8-9 hours. Remove corned beef and vegetables from Crockpot and cover with foil, and then put into 200 degrees F oven to keep warm, if needed! 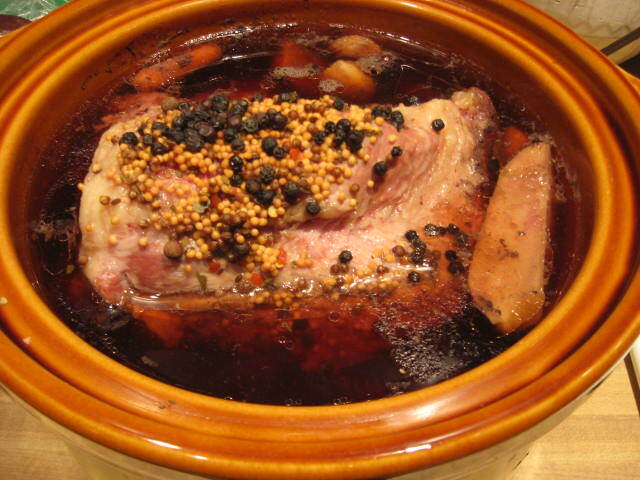 Remove vegetables from slow cooker with slotted spoon and serve with corned beef. I love the cabbage and corned beef in here. But no good for eating much. You have a very delicate seasoning; it made your meal flavorful and savory. It's an awesome recipe, good job! I also would like to make my seasoning from scratch. Can you tell me what seasonings were in your packet?